Virtual enumeration of chemical reactions is a powerful concept in systematic compound library design or combinatorial chemistry. 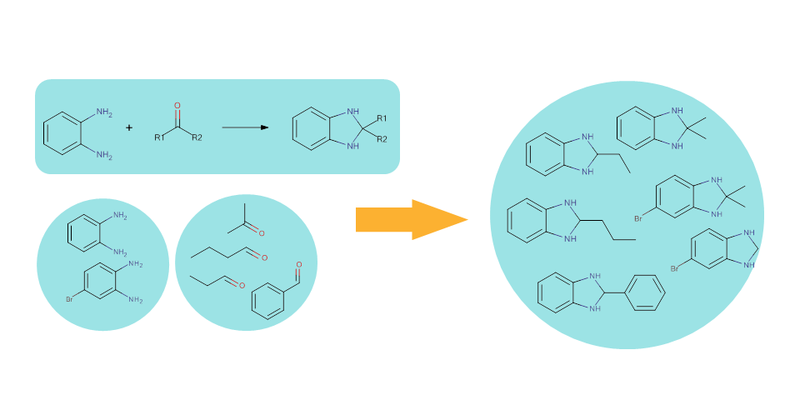 The Reaction based enumeration page of Plexus Suite integrates Reactor Home, the virtual reaction enumeration engine of ChemAxon's JChem technology, that is capable of generating chemically feasible products without pre-selection of reagents by performing a virtual synthesis. The Reaction based enumeration page (go to .../reaction-enumeration, for example https://ps-demo.chemaxon.com/#reaction-enumeration) guides you via a step-by-step approach to easily transform your reactants to products. In reaction-based enumeration, a transformation that is a computational form of a chemical reaction that will be performed on the reactant structures should be defined first. Reactant structures should also be provided that belong to the chemical classes defined in the transformation. Enumerating the full library corresponds to reacting all reactants according to the virtual reaction. This way, chemically feasible compounds can be formed. In order to perform reaction-based enumeration, you need to specify the reaction first. The reaction here is a virtual transformation according to which the reactant molecules will be combined into products. 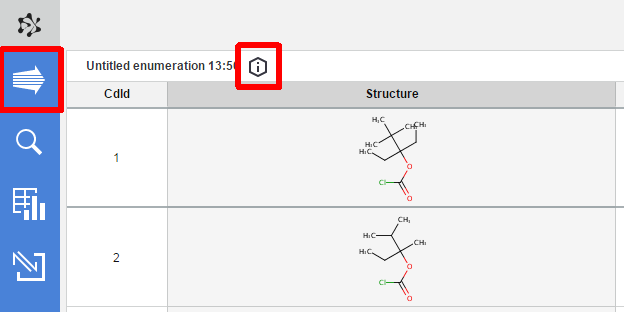 You can set the reaction by drawing it in Marvin JS, or select one from the Library tab, where you can find ready-to-use reactions, created and maintained by ChemAxon chemists. If you choose a reaction from the built-in Library, you should know that there are underlying rules attached to the reaction scheme itself that also affect the outcome of the reaction. The aim is to mimic the result of a chemical reaction as accurately as possible by incorporating some chemical knowledge in the enumeration process. These reaction rules are not available to view and edit in Plexus because they are pretty complex, but they can be checked and modified using Reactor, our desktop tool. Once you have completed selecting the reaction (either by drawing it in Marvin JS or choosing it from the Library tab), you can send it to the Reaction box by pushing the OK button. As a result, additional boxes will appear on the page: each box belongs to a different reactant, and will have to contain the molecule for that reactant. To modify the reaction, click on the reaction schema and edit it in the opening Marvin JS, or select a new one from the Library tab. The reactions of the built-in reaction library cannot be modified. Upload reactants from file: Reactants can be imported from the common chemical file formats. 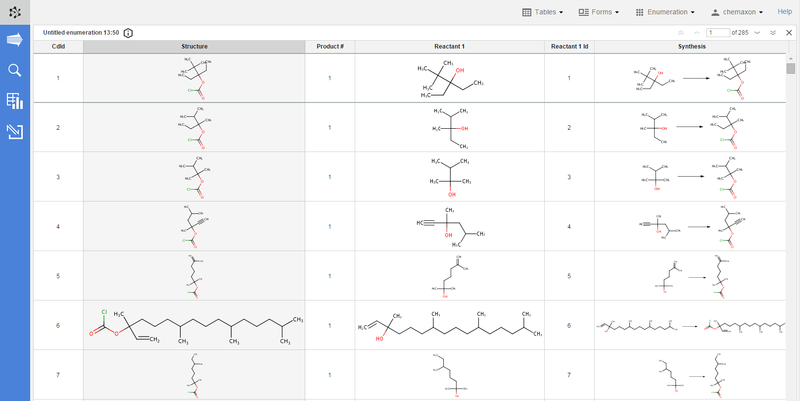 Draw reactants: Reactants are drawn one by one in the Marvin JS editor. Reactor follows the visual order of the reactants in the reaction scheme (left to right, top to down) to process a reaction. Thus, the leftmost reactant is the first one. Be sure to specify the input files in the order defined by the reaction equation. In the preview pane, you can see maximum five successful reactions generated from the reactants one by one. To browse preview, click on Next or Previous on the top right corner of the panel. You can also select different reactants from each reactant definition to check some of the compounds which will be generated when the enumeration will be executed. You can select multiple items by holding down the Ctrl key; the selected molecules will get a blue frame. When you set the reaction and specified the reactants, button Enumerate becomes active.The virtual synthesis starts as you click on button Enumerate. You can also delete the whole content of the Reaction based enumeration page by pressing the Clear all button. As a result, the reaction and the reactants definitions will be deleted, and Marvin JS panel slides in to help you starting over the tailoring process. The result of each enumeration will be added as a new table to your database. The new table will contain the following columns: the compound identifier (CdId) of the enumerated molecules, the generated structures, the number of relevant product when more products were generated in the reaction, the respective reactant, the identifier of the reactant, and the synthesis schema. Molecular weight and formula of the enumerated structure are also present in a new column. Whenever a new table has been created via enumeration, the settings used in the library design process are added to the table as metadata. With the help of this metadata, it becomes very straightforward to apply modifications to prior enumerations, and then create new libraries with these modified settings. By default, the metadata remains hidden when you open an enumerated table, but you can open it by clicking on the icon above the table. The panel sliding down will contain all of the details about the enumeration which was used to create the current table.The new reactor icon on the action bar navigates you back to the compiled reaction based enumeration page of the relevant enumerated table.